If you are looking for an accounts receivable alternative to ACH payments that allows you get your money quicker, then you’ve come to the right place. We are payment consultants and offer our clients a better alternative to ACH that allows them to send and receive money same day or next day to and from nearly any US bank account. We can show you how to collect your money faster and easier. Nearly, any business or organization that has proper authorization and legal authority to directly debit their customer’s bank accounts is a potential customer for this program. Many of our B2B clients like the lower costs of ACH but don’t like waiting 2-4 days to receive the money. So we set out to find a solution to this challenge. We needed to find a solution that would allow our clients to accelerate their cash-to-cash cycles and narrow the time between the invoice date and the date of payment. Accepting payment via business credit card is fairly expensive, typically between 3-4% when accepted card not present or e-commerce, and while convenient, this method is fairly expensive for companies with high average transaction amounts AND the funds aren’t received until two days after the sale. That is not a great solution for several business types. Candidly, most of our clients explore ACH options because they don’t like the cost of accepting credit cards. So if ACH is not ideal and credit cards are not ideal, then what’s the solution? We knew there just had to be a better solution out there so we set out to find it. We leveraged our industry connections and looked at all the solutions we could find; we looked at paper checks but they take longer than ACH with mail time factored in and we looked at PayPal but that’s 2.75% and up to 6 days to receive funds in your bank account. Unfortunately, ACH processing does not support same day or next day funds availability; that’s just not the way the product was designed and developed. After all the research was done, the only solution that we could find that really seemed to make sense for our clients is a new product called “Instant eCheck Conversion”. Not only are the funds available 24-48 hours sooner but the service supports auto-pay recurring billing plans that can be custom set for each customer and chargebacks from contested or disputed transactions are significantly reduced. Designed as an ACH alternative for high volume and/or high chargeback clients like loan originators, collections agencies, billing companies, property managers, leasing companies, membership organizations, B2B wholesalers, and really any organization that needs a simple and automated way to collect on accounts receivable. NACHA Regulation Compliant BOC X9.37. 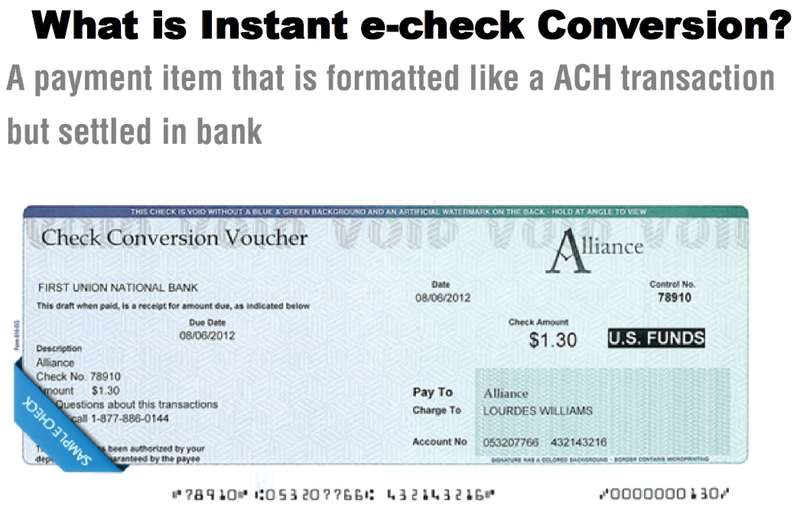 Instant e-check conversation provides a complete solution for companies that currently use or have formerly used ACH; this is similar but better. Using the Instant e-Check Solution, clients can collect payments and receive the money in their account the same day or next day. Same day for the large national banks. Next day for smaller regional banks. Automatically processing recurring transactions makes billing and accounts receivable collections much easier and more efficient. Daily failed transactions reports are available so your office can call to collect in another way if a transaction doesn’t go through. Clients must obtain authorized written consent prior to debiting any accounts. When logged into the secure online portal, you have the ability to submit a request for funds and receive those funds the same day whereby the person being debited is advised the following day. This changes the chargeback scenario/percentages completely. With this method, the person being charged must physically go into the bank and fill out an affidavit; it requires the physical presence of the individual to contest the charge. Nearly any organization legally authorized to debit their customer’s bank account can be approved. That includes payday lenders, consumer lenders, collections agencies, and billing companies and other organizations seeking an alternative to ACH. $1250 monthly minimum. Special pricing available for >1,000 transactions. Available to international clients not incorporated in the United States. No need to convert the USA Transaction by other third parties. Euros, Dollars USD, Dominican Peso, Mexican Peso, British Pound, and others. Deposit is made direct to your bank. Ask a Question. Request a Proposal.